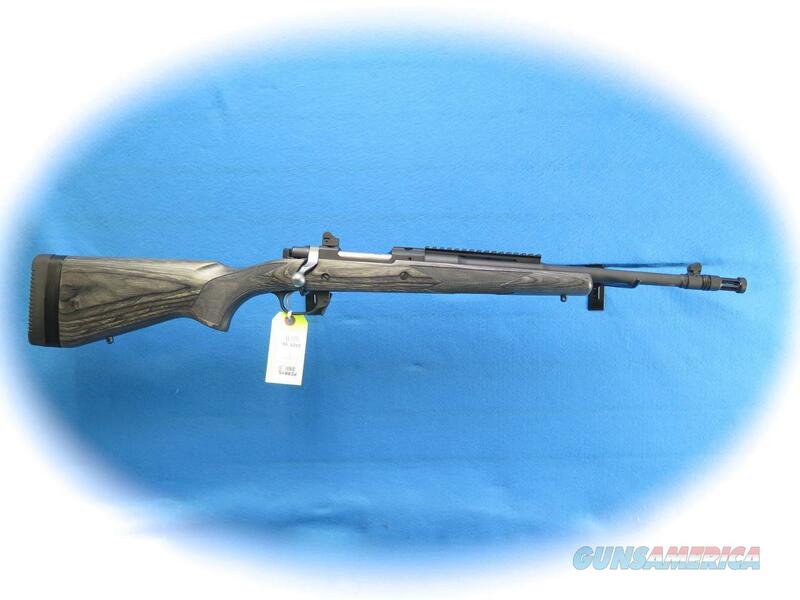 Description: Ruger Gunsite Scout rifle, 5.56mm caliber, bolt action, laminated stock, Model 6824. The forward-mounted Picatinny rail allows for the mounting of modern optics, like an intermediate eye relief scope (not included), for "both eyes open" sighting and super-fast target acquisition. Also offers a built-in, accurate sighting system with ghost ring adjustable rear aperture sight and a non-glare, protected blade front sight. 10-round, detachable box magazine with push-forward magazine release just forward of the trigger guard. Patented integral scope mounts, machined directly on the solid-steel receiver, provide a stable mounting surface for scope rings, eliminating a potential source of looseness and inaccuracy in the field (scope rings included). Soft rubber buttpad with buttpad spacers allow the rifle to be properly sized for different shooters or varying levels of outerwear or defensive gear (three 1/2" spacers included). Free-floated, cold hammer-forged barrel with ultra-precise rifling that provides exceptional accuracy, longevity and easy cleaning. Rugged and reliable with a glass-reinforced nylon trigger guard and magazine well. Non-rotating, Mauser-type controlled round feed extractor is the most positive case extraction system ever invented, and features a fixed blade-type ejector that positively ejects the empty cases as the bolt is moved fully rearward. Developed with Gunsite, this rifle is "Gunsite Approved" and features the Gunsite name rollmarked on the receiver and engraved on the grip cap of laminate stock models. Also includes: rugged, one-piece, stainless steel bolt; three-position safety; sling swivel studs. Laminate stock models feature durable laminated wood that free floats the barrel and remains stable through weather and temperature extremes.